We had been travelling around China for two weeks, and had planned to explore the Great Wall on our very last day. The main reasoning behind that was because we wanted to avoid the weekend traffic. So our very last day of exploring China, was spent at the Great Wall – which turned out to be the best way to end the trip! After a subway, confusion, more confusion, a chat to a group of children, waiting, and an hour train ride, we arrived at Badaling train station. From there, we just followed the crowd. Before we knew it we were handing over yuan for an entry ticket, getting out bags scanned (typical China), and standing in front of two signs, 'South Side', 'North Side'. We stood there for a moment, in a bit of a daze. There were a few reasons we chose the South, 1. it was less crowded, and 2. our roomie the night before very specifically said he walked the South Side. So specifically he literally showed us a picture he took on his phone of the sign saying 'South Side'. We took his word for it. The South side was everything I wanted and more. There were plenty of tourist free moments, of just us standing on the wall, taking it all in. 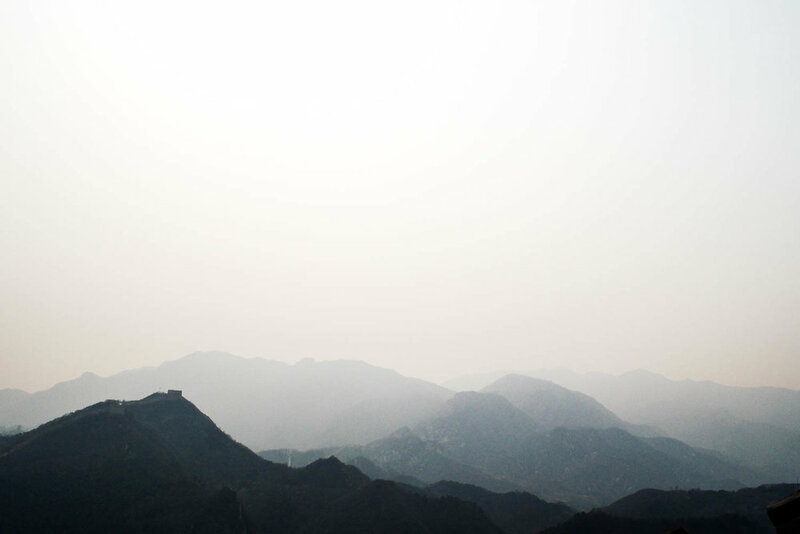 We were surrounded by picturesque mountains, covered in a layer of smog. But the South is not for the light hearted. Turns out the South Side was more of an intermediate walk. Well, by walk, I mean a 90 degree upward angle. Us, two westerners, in our Ugg boots, stumbling up the Great Wall. Yes you read that correctly, we were wearing Ugg boots, walking the Great Wall, oh the shame! Turns out wearing in Docs while overseas is probably not the best idea (I can see you rolling your eyes, I know, I should have known better!). And of course, Maddie's boots split second week in. Our feet were in the wars, and after watching person after person walk by in their Uggs, looking oh so comfortable and warm, we bit the bullet and bought some. I must say, I now understand why Ugg boots are a favoured choice of shoe in colder climates – they're like walking on a cloud of warmth! Anyway, moving from my feet back to the Great Wall... I highly recommend the South Side! That said, if you have a day or so up your sleeve, do both! The North offers you the highest point of the wall – given you'll be sharing that with tonnes of other Chinese tourists. What I liked about the South was the fact that it wasn't overly busy, and had some damn good scenic shots. It's as though, the further you went, the better the view got. It was magnificent really. I've been struggling to put into words the feeling of walking the Great Wall. It's like the feeling of seeing any other wonder of the world. You know what it is, you've seen pictures and movies about it your entire life. But when you're actually there, standing in front of it in real life, you become absolutely speechless. Those moments are when you just take it all in. You pinch yourself because the fact that you've come so far, across so much land, through thick and thin, and here you stand – it's truly incredible. I imagine going back in time, meeting primary school me learning about The Great Wall of China. Bending down, and whispering in little me's ear, 'psst, hey, it's me, future you, just letting you know that one day, you'll walk The Great Wall of China. I'm not kidding. You really will'. I don't know what little me would have said in response, probably would have sat there looking the way I looked actually standing on the Great Wall – mesmerised. Tell me, what thoughts go through your head when you're taking in a monument for the first time?